Ever find yourself in a situation where you are dealing with a business practice you are unfamiliar with and you can’t understand any of the jargon being used? You are not alone! Many fields have a unique lingo that is used to describe industry specific items and occurrences. While it is not expected for you to be well-versed in the turns being used by your dentist, lawyer, or shipping company, it could be beneficial for you to brush up on some commonly used terms so you’re not left in the dark. Promptus wants all our clients to be in-the-know and comfortable when communicating with one of our team members. While we are more than happy to explain any jargon that may be unrecognized, we also wanted to provide a little cheat-sheet for potential clients and any interested parties may use to acquaint themselves with some unfamiliar terminology. Accessorial Charge: Additional fees that are charged to add-on services or equipment required for the delivery of your cargo. Backhaul: When a driver transports cargo during the return trip of a commercial vehicle, it is known as a backhaul. This helps the cargo vehicle get the most out of their trips. Bill of Lading: A document issued by a carrier to a shipper, signed by the captain, agent, or owner of a vessel, furnishing written evidence of receipt of the goods (cargo), the conditions on which transportation is made (contract of carriage), and the engagement to deliver goods at the prescribed port of destination to the lawful holder of the bill of lading. Customs Broker: (U.S. Customs) An individual or firm licensed by U.S. Customs & Border Protection to act for importers in handling the sequence of custom formalities and other details critical to the legal and speedy exporting and importing of goods. Carrier: An individual or legal entity that is in the business of transporting passengers or goods for hire. Shipping lines, airlines, trucking companies, and railroad companies are all carriers. Container: A single rigid, sealed, reusable metal box in which merchandise is shipped by vessel, truck or rail. Ocean shipping containers are generally 20, 40, 45 feet long. Ocean freight container types include: standard, high cube, hardtop, open top, flat, platform, insulated, refrigerated, etc. Holding a carrier’s driver and/or truck trailer beyond a certain stated period of “free time”, often resulting in the assessment of detention charges. The delay in clearing goods through customs resulting in storage and other charges. The prevention, by government authority, of a vessel and/or cargo leaving port. Cartage and Drayage: Cartage is the movement of goods for short distances, usually by truck. It is also referred to the charge to pick up, move and deliver good short distances. Drayage is the charge made for hauling freight or carts, drays or trucks. Freight Forwarder: A person engaged in the business of assembling, collection, consolidating, shipping and distributing less-than-carload or less-than-truckload freight. Also, a person acting as agent in the transshipping of freight to or from foreign countries and the clearing of freight through customs, including full preparation of documents, arranging for shipping, warehousing, delivery and export clearance. Hazmat: Shorthand for “hazardous materials”, which essentially is any material that could cause potential harm to anything or anyone it comes into contact with. Special endorsements are needed from all parties involved to legally transport hazardous materials. Incoterms: Shorthand for International Commercial Terms, which are a series of pre-defined commercial terms published by the International Chamber of Commerce (ICC). Incoterm define basic shipping terms. Intermodal: Cargo that is shipped using multiple forms of transportation, such as rail transport and cargo trucks. Lane: A route of transportation that is regularly taken, most often by commercial transporters. Less Than Truckload (LTL): A shipment weighing less than the weight required for the application of the truckload rate. Lift gate: A mechanism on the back of cargo trucks that allows the driver to load and unload goods more easily. A lift gate is usually required for shipments that are being picked up or delivered to a destination with no shipping dock. Reefer: A temperature controlled container that keeps cargo such as food at the proper temperature throughout the transportation process. Tender: A fixed price offered to move cargo. Third-Party Logistics: A term used when distribution services are outsourced through a third-party. Promptus LLC may be considered a third-party global logistics company. Transportation Management System: Often abbreviated to simply TMS, this is a sophisticated software that allows freight forwarders to easily analyze and automate transportation operations. This is especially beneficial for companies handling large amounts of commercial cargo. Very educational! thanks for the post. I really like that you talked about the technical terms of shipping such as “bill of lading” and “backhaul.” It makes sense that these terms are important for a business to remember, especially for oversea shipping. 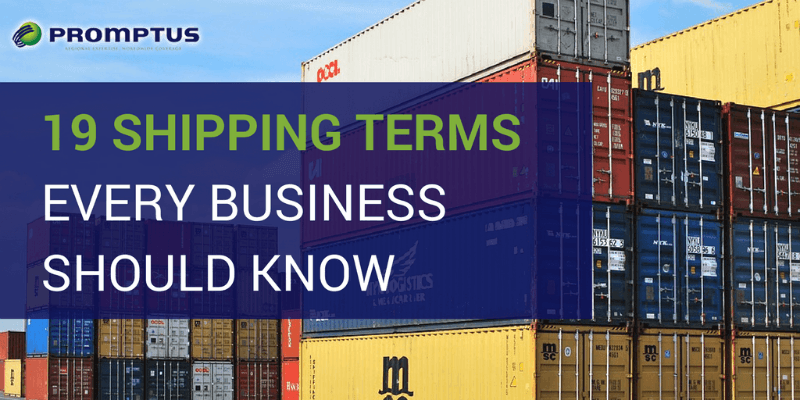 It’s something to keep in mind because simply remembering these terms could save a lot of confusion for a company just looking to ship or having products shipped to them.